After my visit to the St Louis Cafe, I almost feel bad that it has gone unnoticed by me for as long as it has. Until last week, I didn’t even know the cafe existed and it was only when James vs. Burger reader Emma Duguid posted a photo of a burger on our Facebook page and told us that the cafe were serving up juicy, pink in the middle burgers in the West End. The first thing I noticed about the St Louis Cafe was how warm and inviting it felt as soon as we walked through the door. It almost feels as if your best friend has decided to open up a cafe and bar in their living room – from the fairy lights draped over the walls and pillars, the old wooden cabinets and fireplace, the sofas and padded benches by the window and the eclectic furniture dotted around the cafe, St Louis invites you in and wants you to stay a while. I was immediately reminded of one of my favourite cafes in New York City called the Great Jones Cafe, both in terms of look and feel and the menu being served. St Louis is all about food to feed the soul. From hearty handmade burgers to large portions of spicy chicken and chorizo gumbo, there is definitely a flavour of the American South present here. 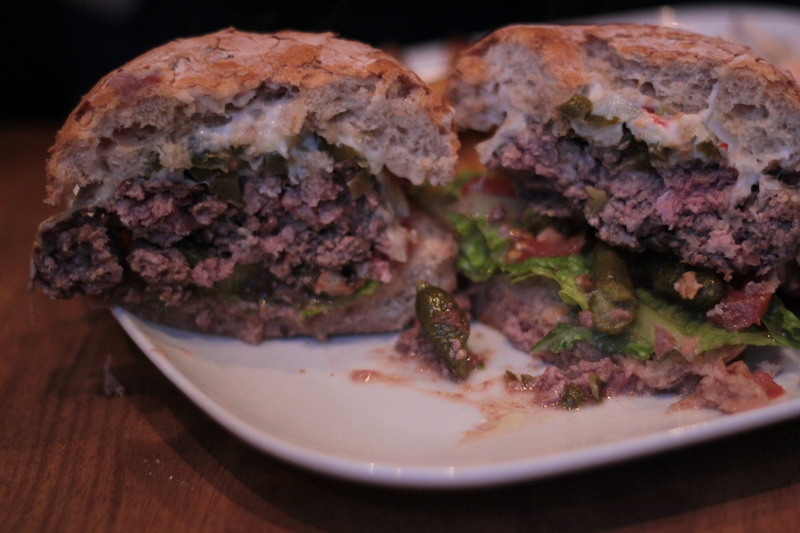 After a quick glance at the menu, I decided to go with the St Louis Smokin’ Burger, consisting of a handmade steak mince patty topped with Monterey Jack cheese, jalapenos, pickled gherkins and a homemade chilli mayo on a toasted bun. The menu at St Louis states that all burgers are served pink in the middle and to inform the staff if you would prefer your patty cooked a different way. Fine by us – a little pink in the middle is how we like our burgers! The burger itself was one of the juiciest I’ve ever had the pleasure of tasting. Before I had even cut into it or taken a bite, a light push down on the toasted bun caused floods of juice to ooze out of the patty and on to the plate! Cutting the burger in half revealed one of the most well cooked patties I’ve ever had in Glasgow – perfectly pink in the middle and lovely and charred on the outside. Presentation wise, this burger gets top marks. Before devouring the burger, I sliced a little off of the end of the patty as I wanted to taste it on it’s own. Believe me when I tell you that this is one well cooked burger. Soft, succulent and juicy on the inside and packed full of flavour – the steak mince really shines here. I really couldn’t have asked for it to be cooked any better. Together as a whole, the burger was mostly excellent – the bun was toasted absolutely perfectly and held everything together well, even with the copius amounts of juice that were leaking on to the plate. 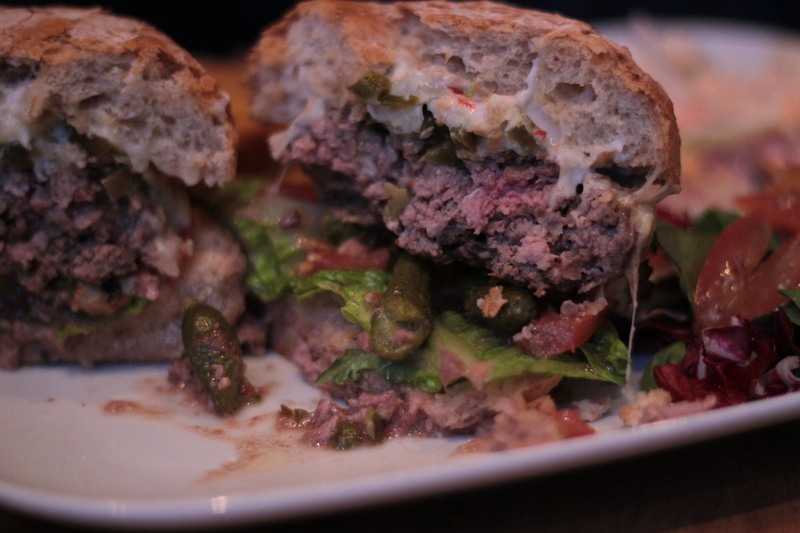 The Monterey Jack cheese added an extra dimension of moisture and flavour to the already fantastic beef and the jalapenos and chilli mayo gave everything a nice little finishing kick. My one and only gripe was the amount of pickled gherkins on the burger. I love gherkins and was looking forward to seeing how they would compliment the spicy flavour of the mayo, but there were simply too many on the burger and I felt that they overpowered the other flavours present to the point where I was finding it difficult to taste the chilli mayo or the cheese at all. As I had cut the burger into two halves, I took most of the gherkins off of the second half and left only a couple, which resulted in a much better overall taste. This was my only complaint, but has no reflection on the overall quality of the burger itself as once I took the gherkins off, I was able to get a better taste of all of the flavours present. 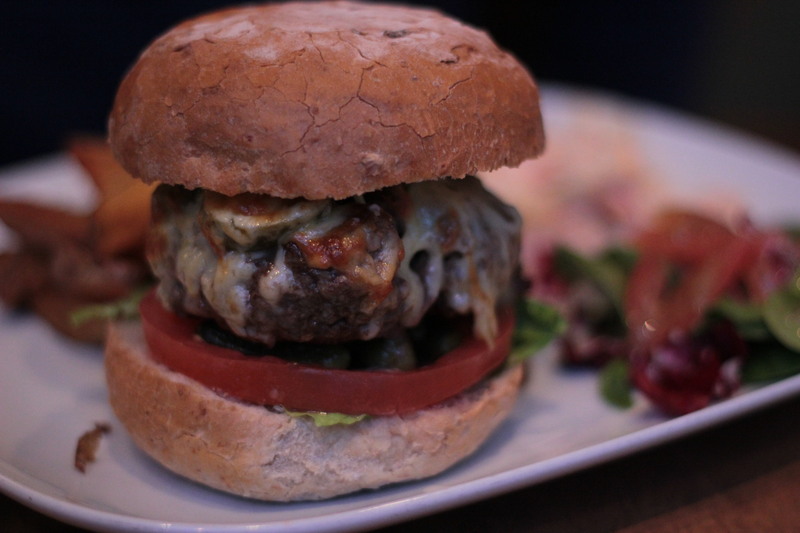 A little less gherkins and a little more chilli through the mayo and this may very well have been a perfect burger. The burger was served up with a portion of potato wedges, salad and chunky coleslaw. Overall, the St. Louis Smokey burger is one of the best, most well cooked burgers I’ve had in Glasgow. Cooked absolutely perfectly with a nice layer of pink in the middle as standard – these guys know what makes a good burger. A little too many pickled gherkins aside, there’s very little I’d change about this dish, if anything at all. I’m shocked that I didn’t find out about the cafe sooner, as burgers this good really should not be going unnoticed by us here at James vs. Burger! As I chatted briefly with one of the staff members as we left, she described the cafe as ‘a really nice wee place’, which is about as perfect a description you could come up with. They also have live music during the week and we’ve heard they are dog friendly too! Get yourself down to the St. Louis Cafe, pull up a chair (or a chouch), relax with a good book or newspaper, order an ice cold pint, soak in the unhurried, relaxing, warm and friendly atmosphere and grab yourself one of the best burgers in town. Husband of forementioned Emma Duguid and budding burger coniseuir, I think what your doing us great! I’ve ate my way through piles of pantish pattes around glasgow and Scotland, and I have to Agree that St. Louis is amongst the best burgers I’ve ever had. I love the confidence in the cooking of the burgers, that they don’t have to throw oddles of extras at it to give it some flavour. I only wish some more well established restaurants/brasseries would take a leaf out of their book! Keep up the good work, and if you need a correspondent I can recommend Emma, she is a great critic of restaurants and a real foodie!